Home / Automotive / Cars / All New Audi A6 – Is It A BMW 5 Series Beater? When was it that Audi revolutionised their brand to be one of the worlds top luxury saloon, hatchback and performance vehicles? I'm sure a lot had to do with their record-breaking reputation in the world rally and the Le Mans. But, to me, it was the when the Germans launched the b5 RS4 Avant. Thereafter, Audi's reputation scaled up like an exponential graph. Audi believes its all-new 2018 A6 saloon is finally the car to usurp the BMW 5 Series as the champion of the ultra-competitive executive saloon class, thanks to its complete reinvention inside and out, with a new look, fresh technology and a bolstering of its sporting appeal. 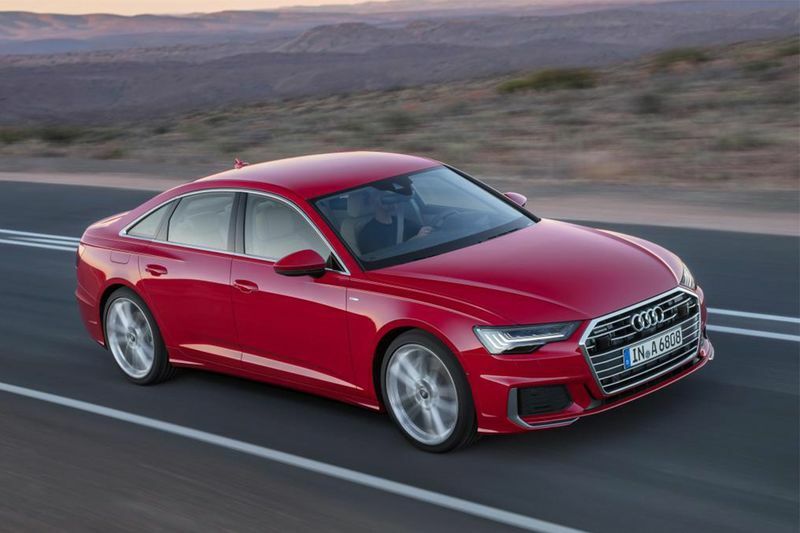 The eighth-generation A6, on sale in June, will be available with mild-hybrid engines only, much like the recently launched A7, and will later offer a plug-in hybrid as “bridge technology” to pure electric. For now, the new executive saloon will be offered with four engine options: a V6 3.0-litre TFSI petrol and three diesel engines, a 2.0-litre TDI and a 3.0-litre TDI, available with one of two types of tune. The 3.0 TFSI and 2.0-litre TDI use a 48V electrical system, which has a lithium-ion battery positioned in the rear axle and a starter/generator at the front of the car. This mild-hybrid system switches off the engine and cruises between the speeds of 55km/h and 160km/h. When decelerating, it switches off the engine between 7km/h and 23km/h. The two 3.0-litre TDI powertrains instead use a 12V electrical system that does not offer these features. The 12V system allows CO2 to be reduced by 4g/km and the 48V system cuts CO2 by 10g/km. Although the mild-hybrid line-up is currently unusual in the car market, many manufacturers will soon offer the same in order to meet ever-demanding CO2 and air quality targets. Audi also says a smaller petrol unit, a 2.0-litre TFSI, will arrive in the UK at some point in response to the growing demand for petrol, as diesel sales continue to fall. The new A6 is now offered with an automatic transmission only. Demand for a manual transmission in its predecessor was less than 5% and Audi also recognises that adaptive cruise control works much better with an automatic gearbox. It also allows for some of the A6’s 37 driver assistance systems, such as parking a car remotely from a smartphone app, which is an updated version of its existing Parking Assist system. The UK will have two trim levels for the A6 – SE and S line – and Audi’s Quattro four-wheel drive will be standard on all 3.0-litre models. The A6 is 7mm longer at 4 939mm, 12mm wider at 1 886m and 2mm taller at 1 457mm than its predecessor. That makes it fractionally longer and wider than the 5 Series but 22mm lower. Wheel size has also increased and ranges from 17in to 21in. The largest wheel size available on its predecessor was 20in. Audi is positioning its infotainment system as a key selling point for the A6, describing it as a “futuristic operating concept”. There are two central touchscreens, both 8.6in as standard, with a 10.1in upper screen available as an option. The system, known as MMI, allows vehicle functions, shortcuts and favourite buttons to be dragged and dropped, akin to a smartphone. The top screen controls infotainment and navigation and the lower screen is used for climate control, convenience functions and text input. It has been designed so the driver’s wrist can rest on the gear lever. This package of technology, new styling and mild-hybrid powertrains is what Audi hopes will help claw sales back from the 5 Series. The current 5 Series, launched in 2016, has achieved a growing advantage in sales over the older A6, with BMW selling almost 50% more 5 Series than Audi achieved for the A6 in Europe in 2017. The 5 Series has long been rated the better car in terms of both driving and all-round appeal but the A6 is highly rated too. Premium executive saloons are one of the few segments not yet negatively affected by SUV growth – 2017 global sales were up 14%, according to Jato Dynamics – so Audi is in a good position to capitalise with the new A6. An estate version, the A6 Avant, will be revealed later, and a hot RS6 version is very likely but unconfirmed. Audi will also offer a long-wheelbase version of the A6 for the crucial Chinese market.